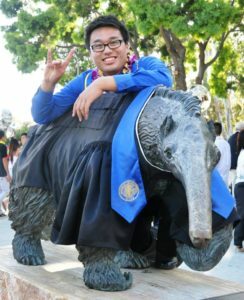 Jed Chun, AACF UCI class of 2014, responded to the question, “How has AACF impacted your life? Looking back, it’s hard not to marvel in the amazing ways that God has worked through AACF to get me to where I am today. If I hadn’t met the brothers and sisters of AACF in college I think it would be easy to imagine a life apart from God right now. The loving community that I found a part in really helped me to reconnect with God at a time of my life when I really wanted nothing to do with Him. Thankfully, God had other plans. Through the community at AACF, He helped me to grow and experience both grace, mercy, and accountability more deeply than I had ever experienced before. I really learned what it meant to live in community with other believers and to walk with them every single day. I particularly remember the experiences that I had at LTC, although I don’t quite remember all of the content of the plenary sessions, the experience in it of itself was amazing simply because it allowed me to meet some of the most dedicated Christians from campuses all over the west coast. Thanks to LTC (Leadership Training Conference), I’ve come to know many different believers from many different places who all share a profound love for Christ, which is a reminder of how God’s love can overcome geographical and social boundaries. Through the opportunities that I was given to serve at AACF I also got to hone one my spiritual gifts, hospitality, and saw it tested and expanded far beyond anything I would have ever imagined doing. However, the most important thing that I learned in college at AACF was how to live beyond myself and really put God at the top of my priority list. There are times that I honestly wish I were still in college so that I could continue being built up and challenged by brothers and sisters every single day, but there is a season for everything and, although that season has passed for me, I still cherish and am extremely grateful for all the opportunities that I had to grow and share life with the other believers that I found at AACF.